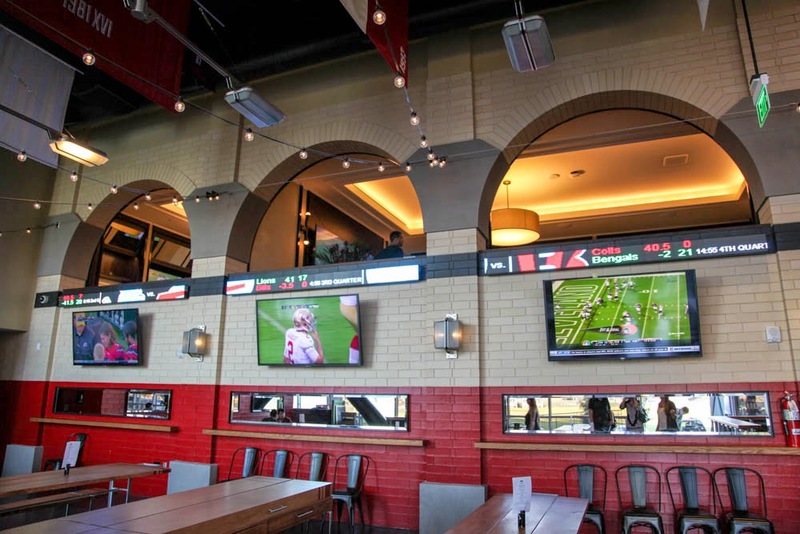 Several weeks ago I had the chance to tour and dine at Bourbon Steak & Pub at the new Levi's Stadium, which is actually three completely different experiences. 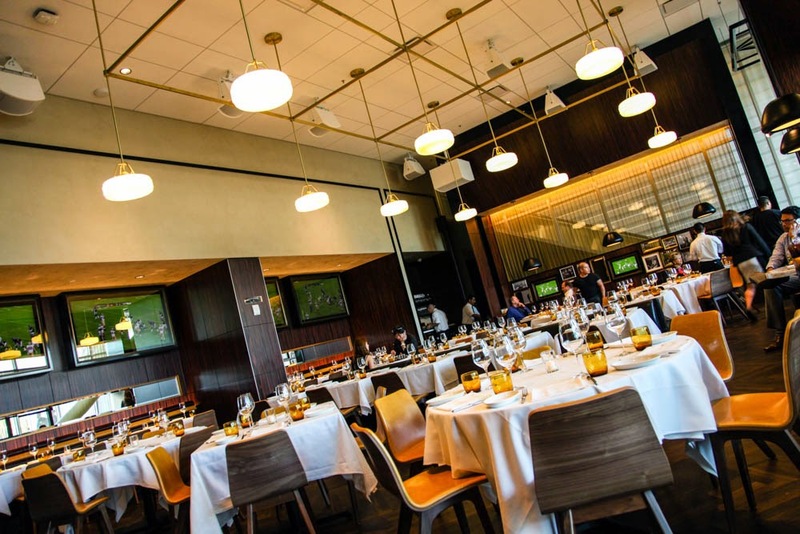 You have a high-end restaurant, a more casual Pub, and the Tailgate which is used for private parties and special events such as away game buffets. 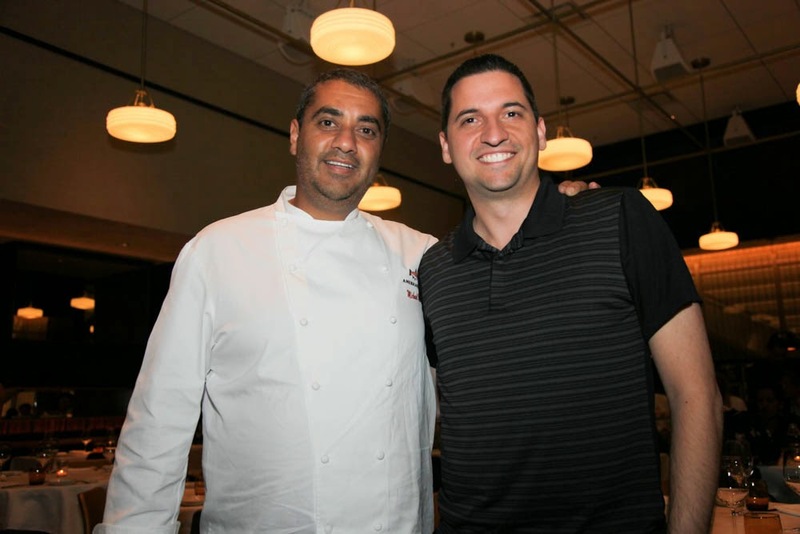 All of it is run by Michael Mina along with executive chef John Cahill (formerly at Cafe des Amis). 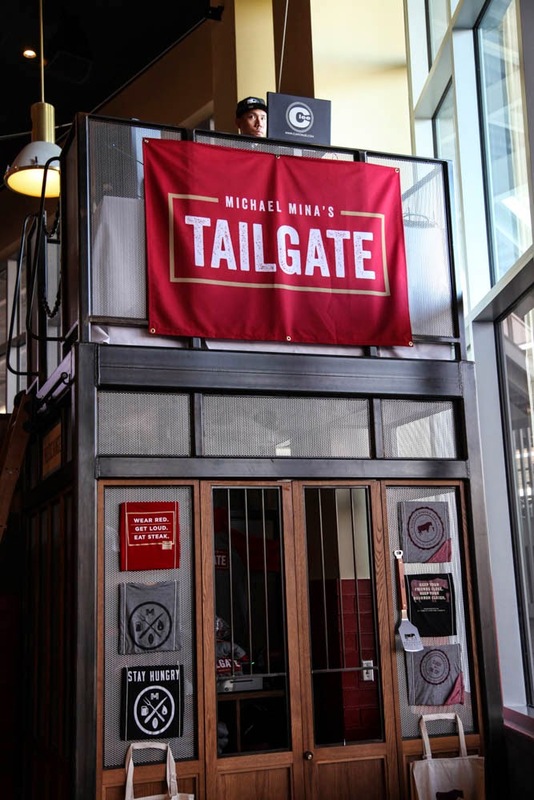 This project is so important to Michael Mina (long-time 49ers fan) that he is planning to make this restaurant his home-base for at least the next year. 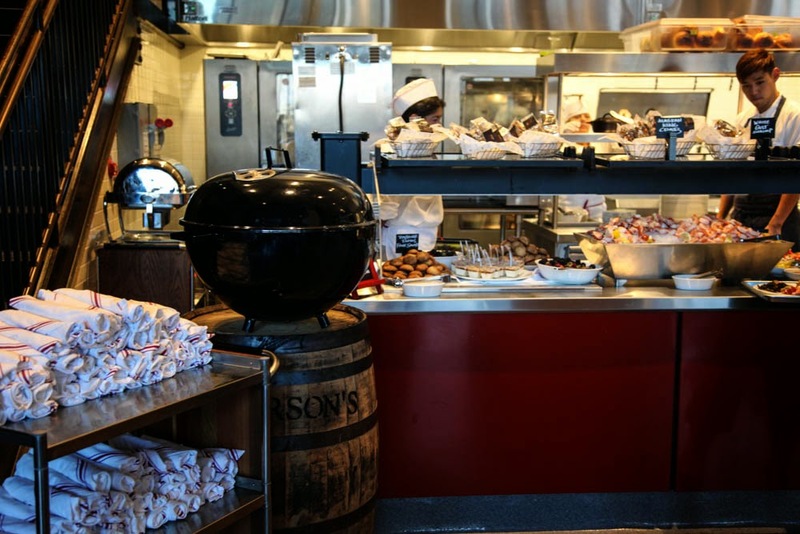 If you dine at Bourbon Steak, I would say there is a good chance he will have a hand in preparing some of your food and might even come out and say hello and pose for a few photos with diners. 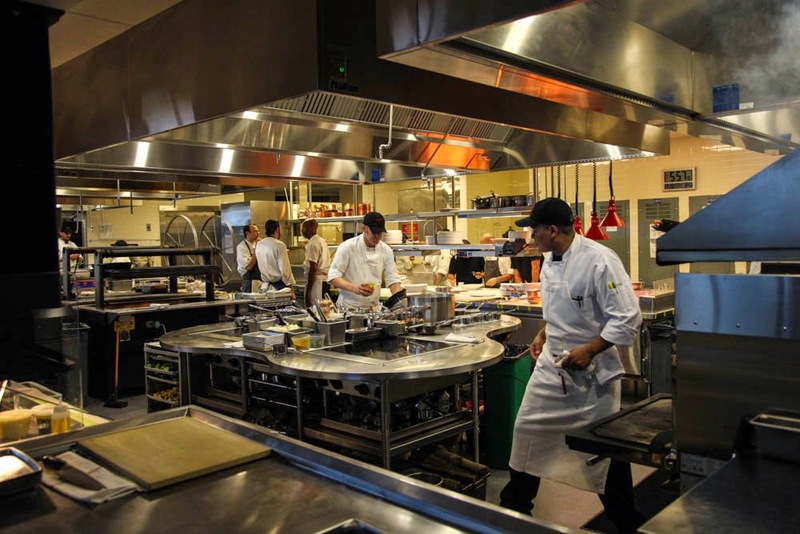 For a celebrity chef with two-dozen restaurants, he is surprisingly friendly and approachable. There are two different hostess desks for the restaurants. 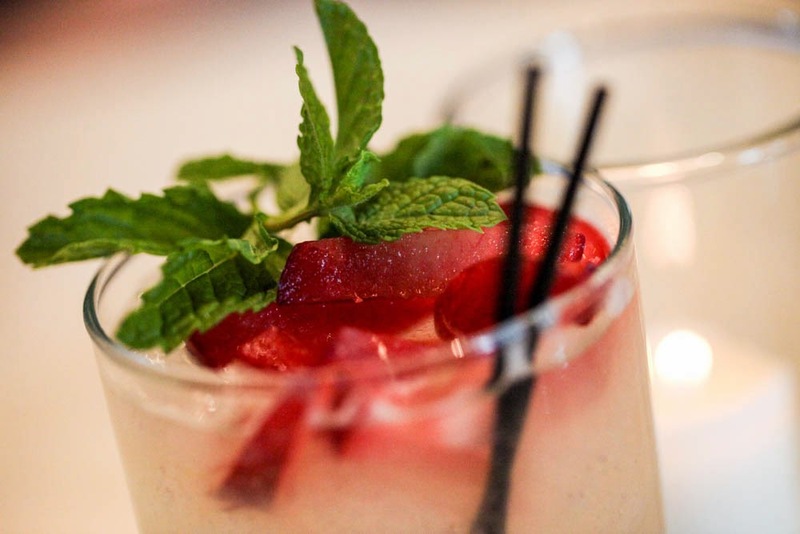 One for Tailgate and another that is shared between Bourbon Steak and Bourbon Pub. That was one of my few gripes as I really think the Steakhouse deserved it's own desk. Walking around Bourbon Steak and Tailgate, there were lobster pots that could hold 200 lobsters each on game day, a wood burning grill, 49ers Cheerleaders, a DJ that spins every day (Clee, who also is the official DJ during 49ers games), and the most impressive thing of all... an epic two-story wood-fire rotisserie! 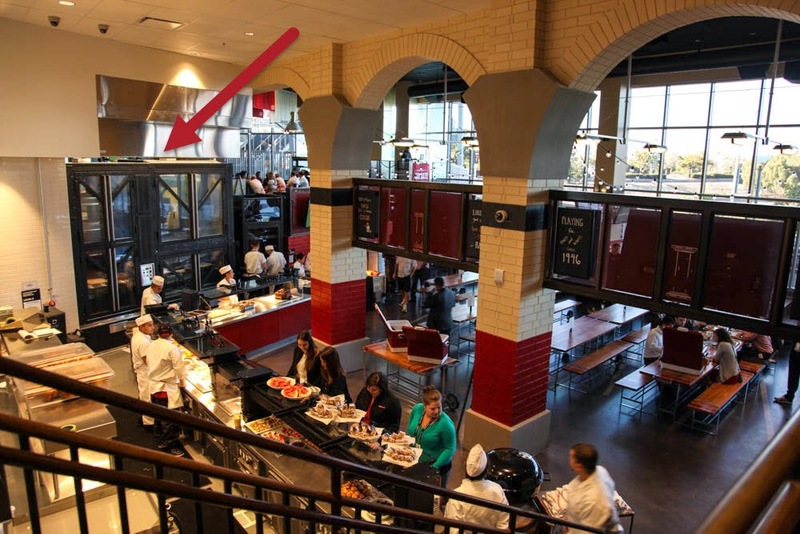 At 13 feet tall, it is the largest indoor rotisserie in the world. 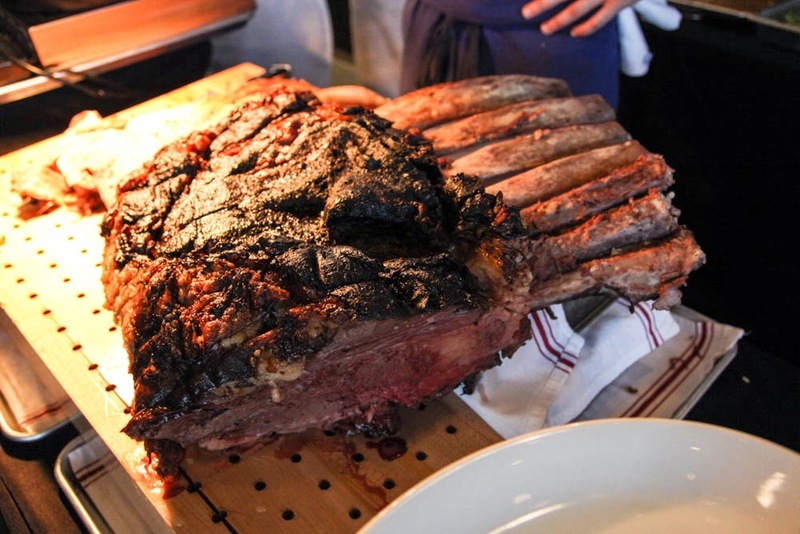 It is so large that it can cook a whole Waygu cow and is used to roast whole hogs for Happy Hour. 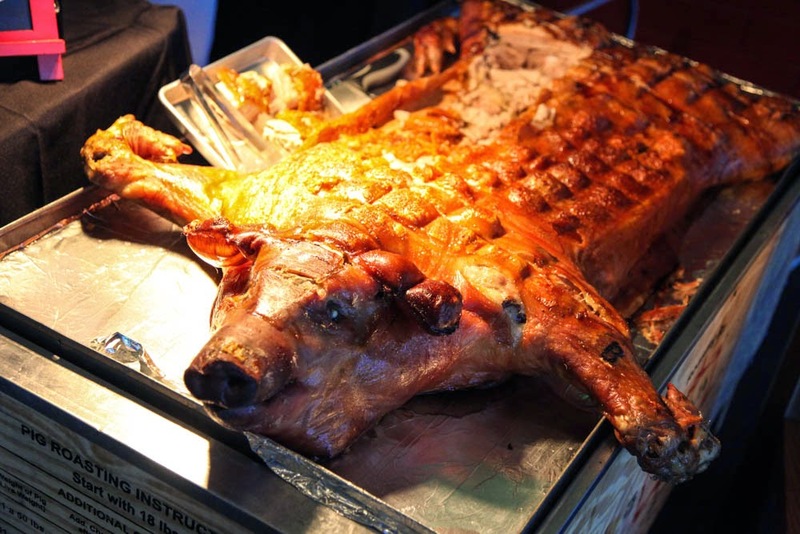 I happened to be there during a 49ers away game and had a chance to watch them prep for the fanciest game-day buffet I have seen over at the Tailgate area. 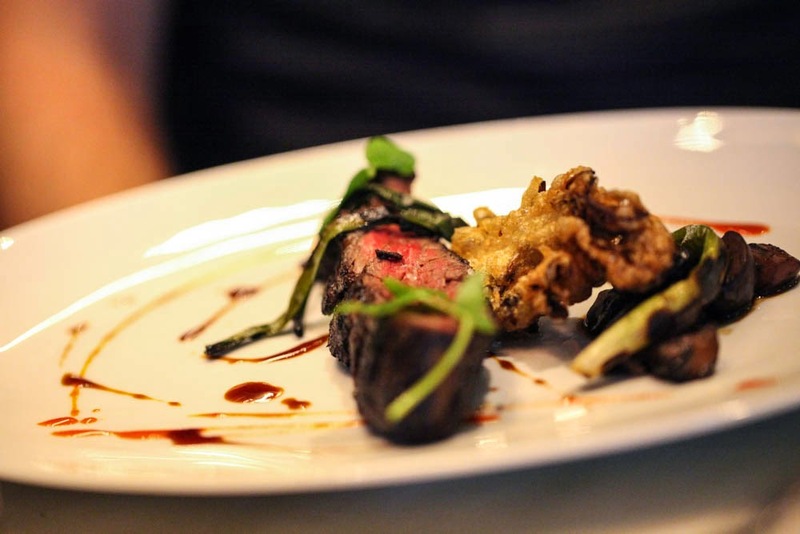 Imagine Skylander Ranch 100% Waygu beef short loin, fresh crab, and a premium taco bar. You can get beers and signature cocktails by the cooler and there are plenty of games like bocce ball, ping pong, etc. to entertain you during commercials. The cost for the buffet is $35 for a single pass or $60 for all-you-can-eat. Completely worth it based on the quality of the food if you ask me. 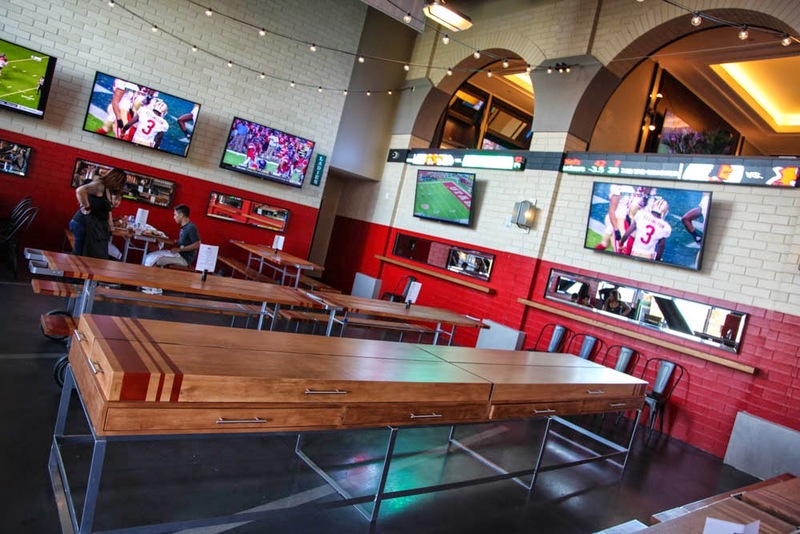 Tailgate has a second floor for private dining which is where the 49ers come to party after games (there is a door that leads directly there from the locker room). 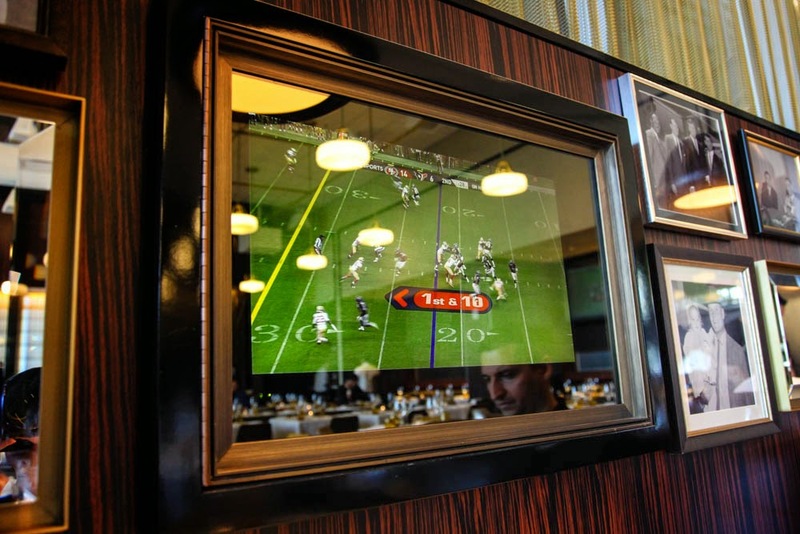 The bars in Bourbon Pub and Tailgate have a huge assortment of 30-40 craft beers in addition to popular favorites. 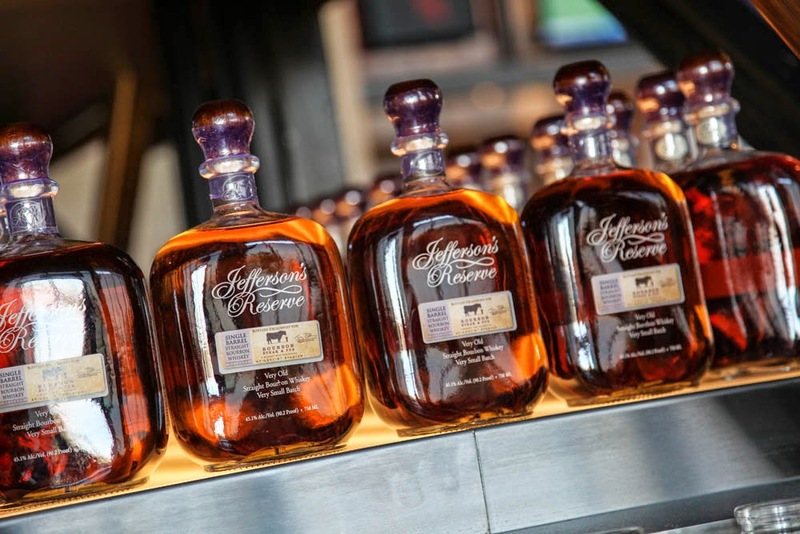 Of course, there are also American Bourbons from small batch barrels that help give this place its name. A couple more unique things and I'll move on to the food. This is the only Bourbon steak that has a merchandise booth and the only one with an element of gamification. 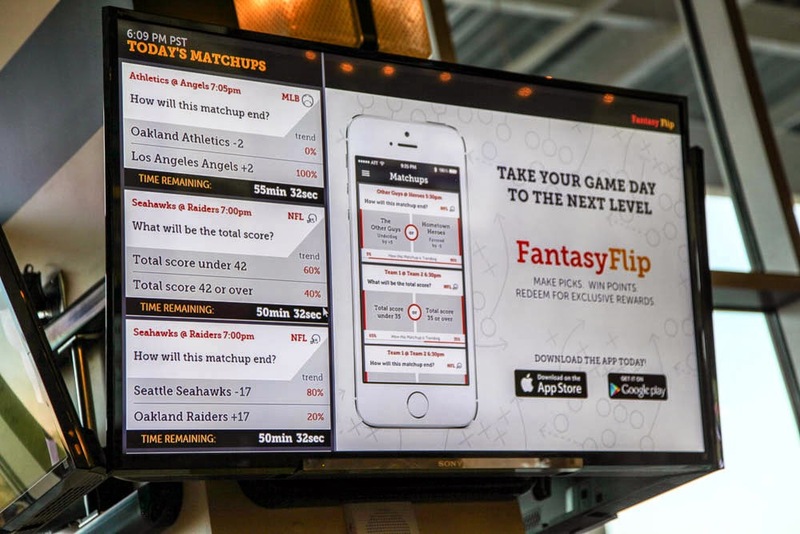 There is a custom "Fantasy Flip" interactive app that is somewhat similar to Fantasy Football. 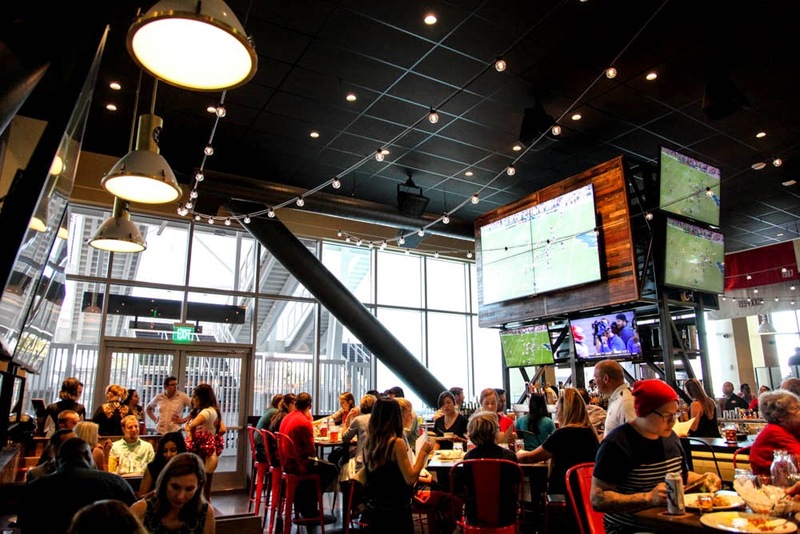 You get game points to redeem for prizes that go all the way up to having a dinner out on the Levi's Stadium field. Over at Bourbon Steak the first thing I noticed when walking in were the assortment of TVs everywhere, pretty uncommon for a high-end restaurant. They were slightly dimmed and there was no audio and are only on when there is a special game going on. When they are turned off, they turn into mirrors--so freakin cool! 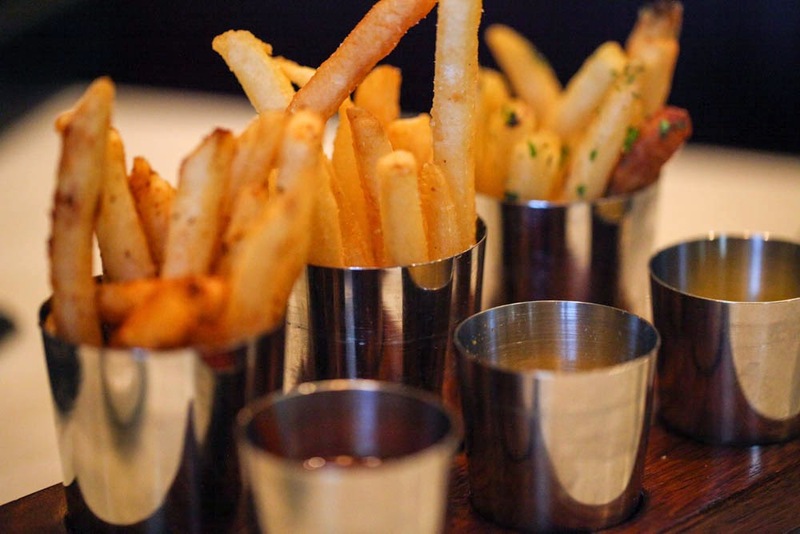 Instead of bread for the table, Bourbon Steak serves three different kinds of fries with a variety of exotic flavorings and sauces. There were ancho chili fries with pickled ketchup, shallot fries with honey mustard, and herbed fries with truffle aioli (my favorite). 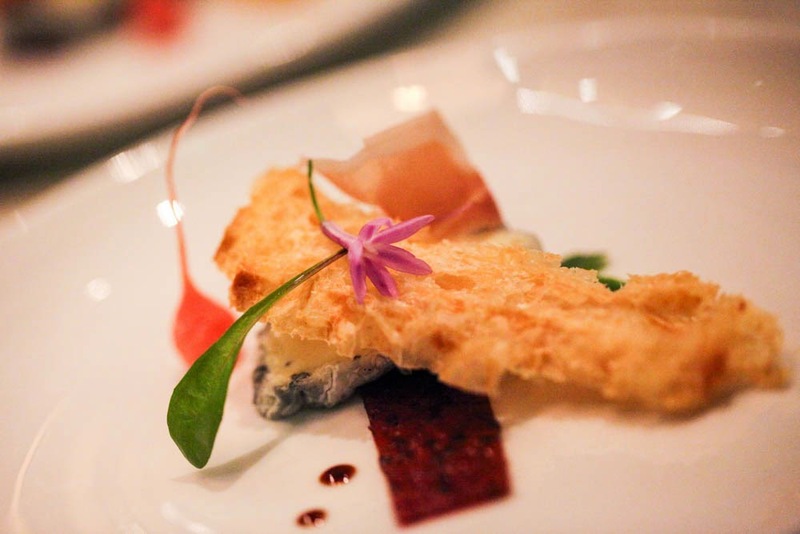 Just because bread isn't served by default, doesn't mean it doesn't exist in the restaurant. On the contrary, YOU MUST ASK FOR THE BREAD. Think of it as a secret item, like asking for animal style fries at In & Out. 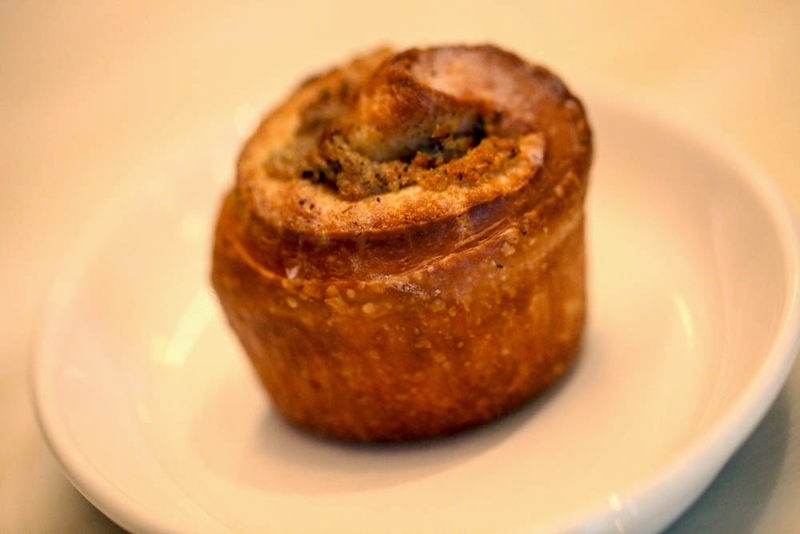 The awesome Bourbon Streak bread is made in house each day with black truffle butter. 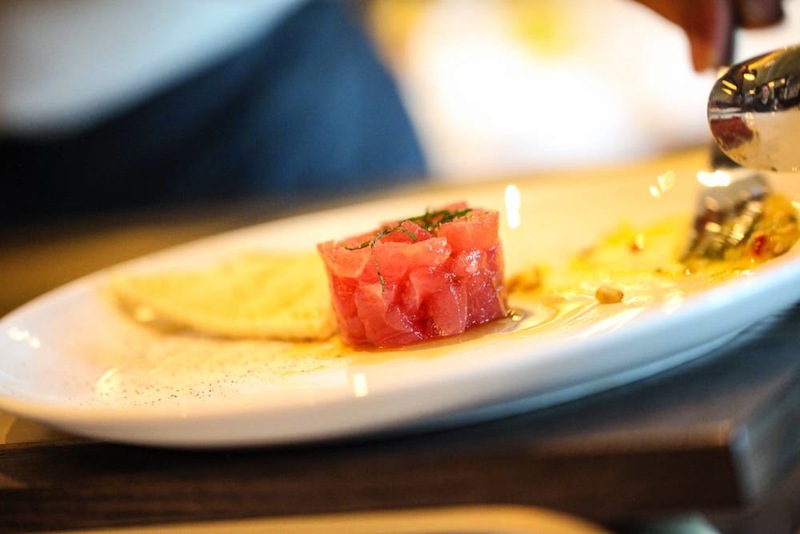 The first course I had was a Michael Mina signature dish: tuna tar-tar mixed with quail egg, pine nuts, spices, and toast. 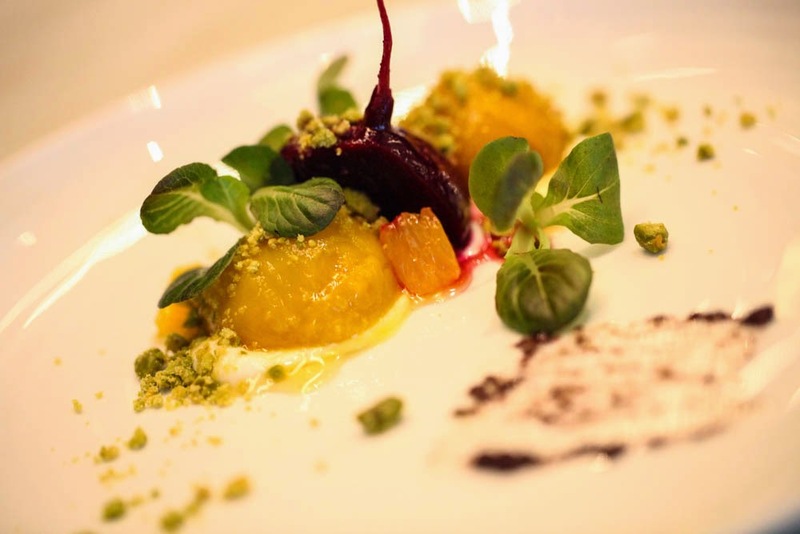 You get to see each individual component of the dish and then it is mixed for you table-side. If you are okay with raw fish, this item is a must. Second was beet & goat cheese salad, perhaps the best I've had anywhere. Other people that I have recommended this dish to have said the same thing. Not only was it delicious, but it was very artfully put together. 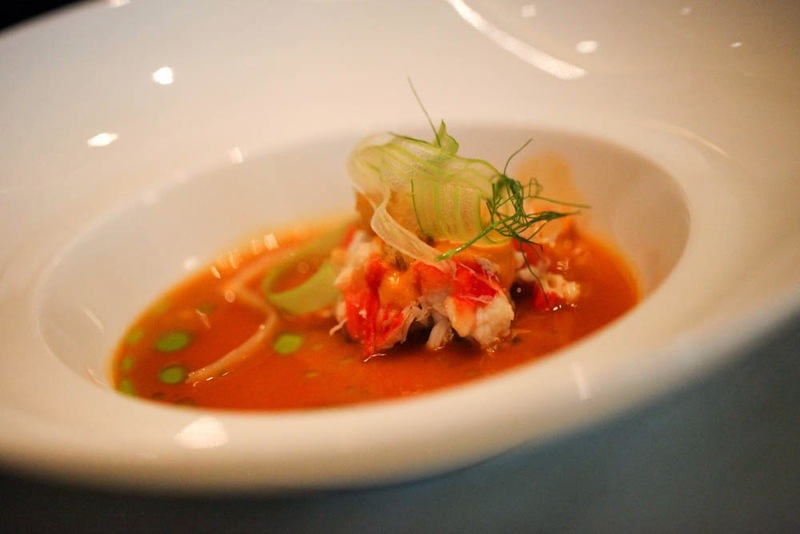 Next was a play on a Bay Area classic, Dungeness crab chioppino. I think this was my least favorite, not because anything was wrong with it but because everything else was so exceptional. The first main course was swordfish + white beans and artichoke hearts. 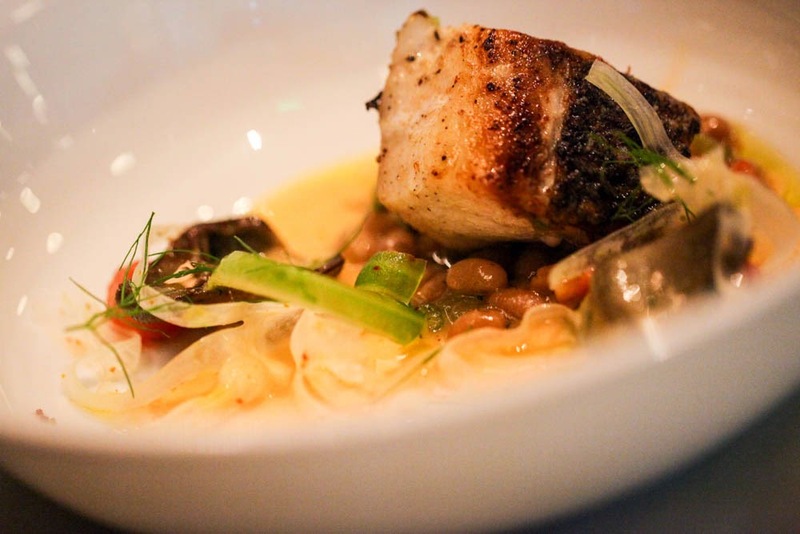 The fish was cooked perfectly and paired brilliantly with the white beans and sauces. Finally, we get to the highlight of the night. An American Waygu Ribcap with creamed corn & broccoli. This was easily on my top 3 list for the best steaks I have ever had. The meat practically melted in your mouth. 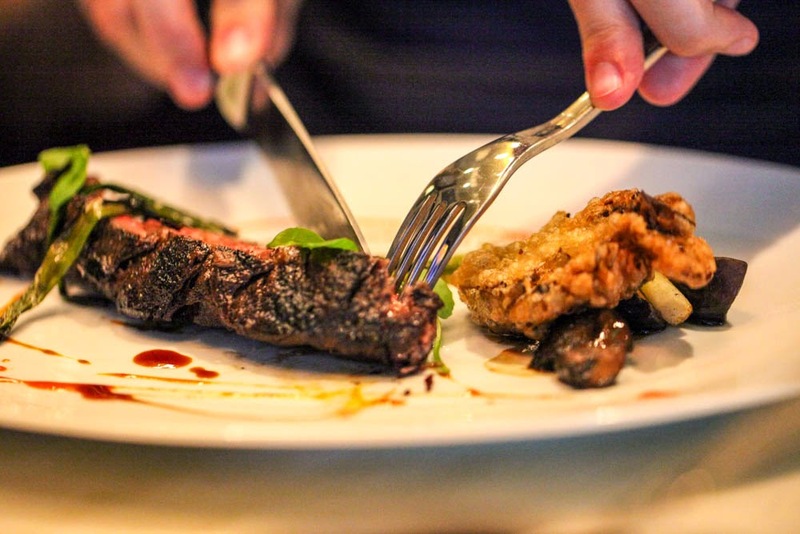 Despite being gluttonously full from all the other courses, I couldn't spare even a bite of the marbled steak. At $80+, this cut doesn't come cheap but is well worth it for a special occasion. You can't go to a place called Bourbon Steak and not get some Bourbon-based drinks! If you can handle a stiff drink, I would highly recommend their Bourbon tasting. This is quite a unique drinking experience that features three different Bourbons. 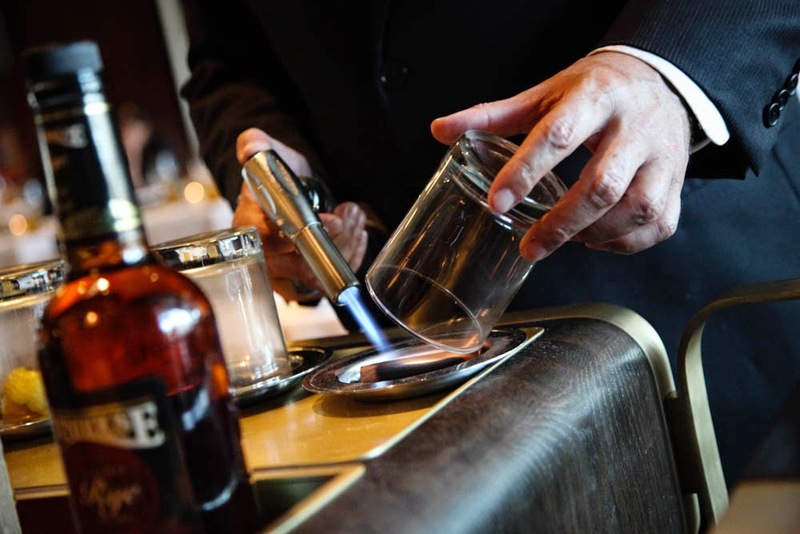 To enhance their flavors, each comes paired with items like citrus, cinnamon, or vanilla--which is then smoked and used to coat each glass before the Bourbon is poured. They also serve this at Bourbon Pub and is worth a trip to get this alone. Everything is done table-side and it was one of the highlights of the night for me. My wife doesn't like strong drinks so she ordered a Bramble, which she loved. She's very tough to please when it comes to alcohol, so the bartenders nailed this one. I also ordered my favorite cocktail, an Old Fashioned. It was surprisingly smooth and just had the right amount of sweetness. The quality of the cocktails was right up there with mixology-type bars. While we did not order wine with our food, they had an encyclopedia of vintages to choose from. 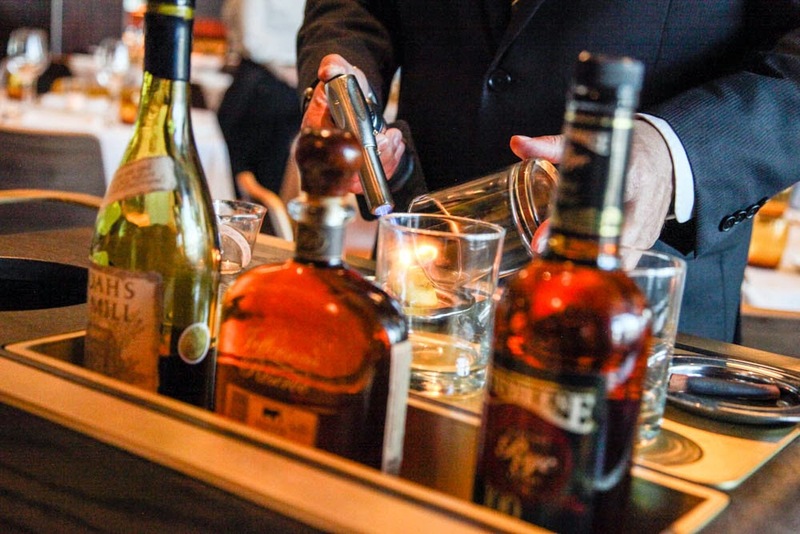 Prices for a bottle start around $50 and go all the way up to the cost of a midsize sedan. No seriously, there is a wine on the list called Domaine de la Romanee - Corti that will run you $19,000. I'm guessing its being saved for the 49ers after a Superbowl win. We shared two different desserts before having to be rolled to our car. The first was an exceptional cheese course. I didn't write down the names of the cheeses but they all met my wife's approval, including a blue cheese which she typically does not like. There was a delicious croissant toast to accompany the cheeses. 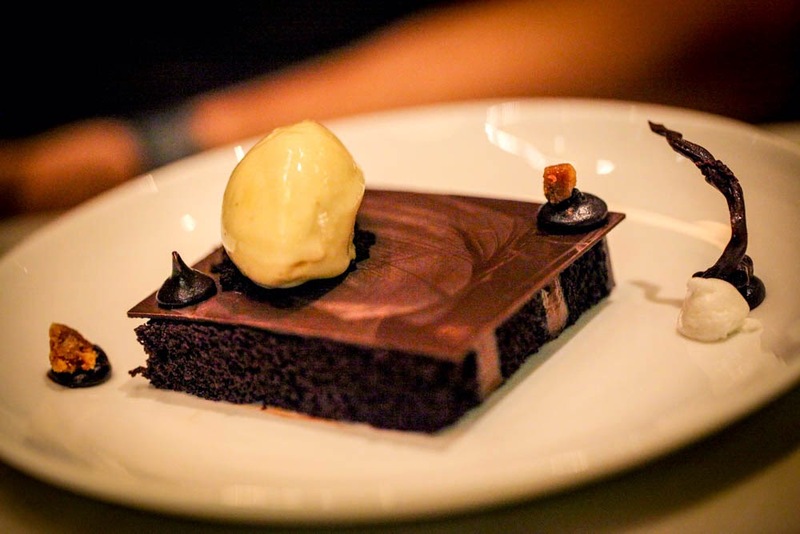 The second was a Devil's food cake with malted vanilla ice cream. If you see this on the menu when you go, I would highly recommend it. I really have to thank the restaurant for the outstanding service we received. Each course was well-timed and everyone that we spoke too was friendly and patient with my barrage of questions. I would say this was on par with the Michelin Star restaurants I have been to in the Bay Area. Our waitress even ran out to the street when she noticed that I forgot my notebook on the table. 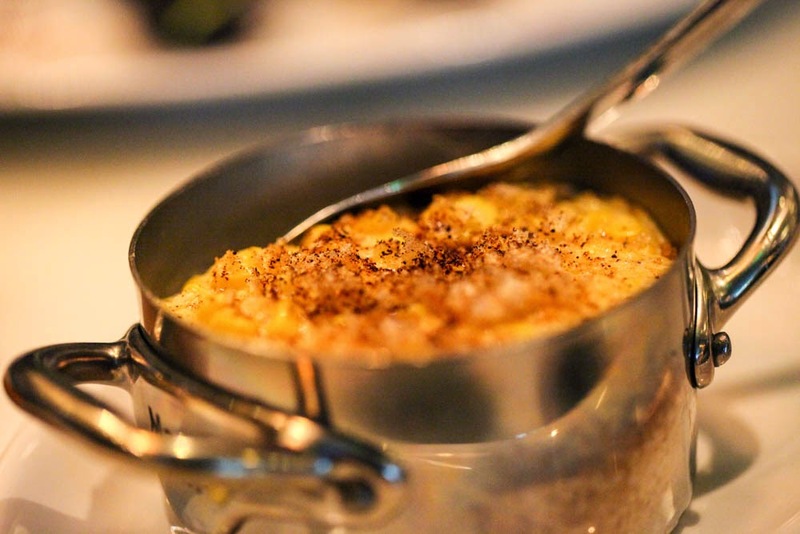 This will be my new go-to restaurant for special events like Anniversaries!